On Monday I shared photos from our Halloween party. One of the things I am just kicking myself over is that I did not get good photos of the “cabanas” we created for the party. In the back yard we set up one white EZ-Up and in the front yard we set up two, side by side. The front EZ-Ups were tied together and had white “walls” that velcro-ed into place to create a bit more privacy. The black panels were what made these look less like EZ-Ups and more like cabanas. Want to know what they are? Plastic tablecloths from the Dollar Store. At a dollar a piece we were able to create the look for less than 5 bucks! I took Duck Brand Tape in Midnight Madness and taped the tops of the panels to the EZ-Up, centering the panels on the corners. When secure, we simply tied a ribbon about halfway down and fluffed it, creating a little volume. Easy! Wrap it with little white lights and you are all set! 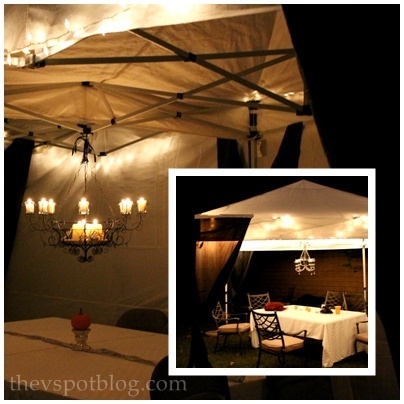 We also hung chandeliers from the middle of the “cabanas” for a little extra ambiance. There are so many possibilities for this. Depending on the occasion, you can easily choose different colors and make it work for just about anything. Never underestimate a woman with her duck tape! !